In recent past, “missionary work” often meant bringing our familiar Gospel to faraway places and other peoples. In secular America today, however, even our own children know little about the Gospel. 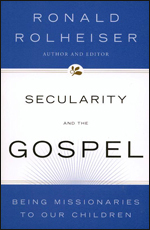 In this major volume, Ron Rolheiser offers original chapters on the question of secularity, and introduces leading voices in Catholic thought to show how Christian faith can thrive in a secular world. Contributing authors: Robert Schreiter, C.PP.S; Michael Downey; Mary Jo Leddy; Gilles Routhier; Robert Barron; Reginald W. Bibby; Ronald Wayne Young, OMI. Loneliness is not a rare and curious phenomenon. It is at the center of every person’s ordinary experience. It is most dangerous when it is not recognized, accepted and worked through creatively. Conversely it is a tremendously creative and humanizing force when it is recognized and lived correctly. Examining current theories on the causes of loneliness and using modern day parables from literature, the cinema and his own experience, Ronald Rolheiser identifies different types of loneliness: some are to be avoided, some endured and others positively taken up and entered into. This outstanding book offers a distinctively Christian approach to the subject, and will reassure and free many to live more meaningfully. “The Restless Heart” won the Winnifred Sanford award in the United Kingdom in 1990 as the best book on spirituality. The popular columnist presents a far-flung overview of our contemporary lives. He enables us to see over the horizon of our time and in doing so gives quieter, sane advice through these perceptive and often humorous essays. He writes with compassion and wit on such subjects as marriage, family life and the presence of God, loneliness and sexuality, death and birth, social justice and humility, the unconditional love of God, language and prayer to present a companion volume to his award-winning “Forgotten Among The Lilies”. Prayer: Our Deepest Longing looks at the issues facing people of faith in today’s culture, and offers a way of more effectively dealing with them by seeking out opportunities for prayer. 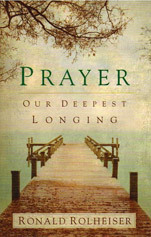 With simple, down-to-earth language, Rolheiser illustrates the importance of prayer and offers techniques on how to pray, using examples from daily life, Scripture, and contemporary writers. He delves into the places that we fear to go with our issues about prayer, encouraging us with gentle kindness and words of hope and inspiration. Recognizing that there is still a stigma, in both the Christian and secular world, surrounding death by suicide, Fr. 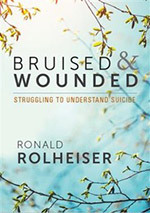 Rolheiser takes his spiritual understanding of the woundedness of those whose lives end in this pain, and “breathes out the compassion and peace of God”. Many, many people in the world have been touched by suicide. Fr. Rolheiser’s writings provide hope, consolation, and empathy to those left behind.